Writer/director pair Joel and Ethan Coen have put together quite the resume through the years, winning Oscars for work on O Brother Where Art Thou, No Country For Old Men, and Fargo. 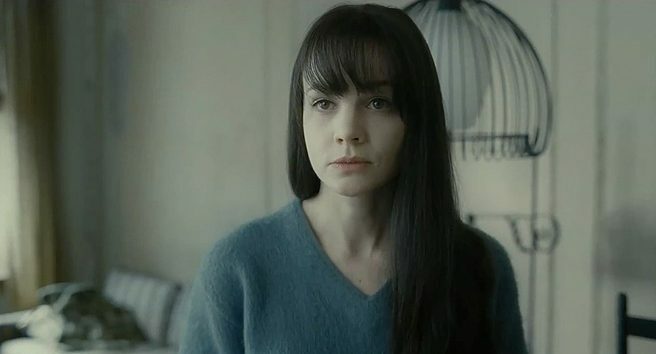 There’s been a lot of early buzz that Inside Llewyn Davis, their latest effort, might be a film to join them, but while there’s little doubt it’ll garner awards consideration in several categories, it falls just a bit short of the best of the Coens’ work. Which isn’t to say there’s not a lot to like in the movie. It’s a good movie. A very good movie that’s clearly been constructed by experts at the craft. The script is sharp enough to cut you, pushing its characters at times to the verge of caricature, but at the same time infusing them with so much personality that I half wanted another hour or two devoted to vignettes of some of the key supporting cast. But Inside Llewyn Davis is unflinchingly and unquestionably the portrait of its title character. 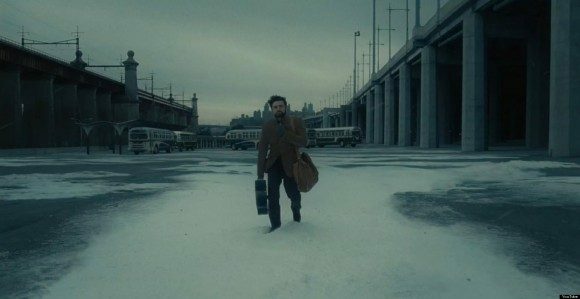 Llewyn Davis (Oscar Isaac) is a cash strapped, couch hopping, down on his luck, homeless folk musician clinging to his dream of performing for a living – doing more than “just existing,” as he puts it at one point – despite a lousy manager, worse record sales, and the still-fresh suicide of his former recording partner. The entire movie displays maybe a week of Llewyn’s life, but at the end of that week we’ve seen Llewyn come full circle (literally – the first scene is also the last, but feels like it naturally belongs in both places) going from artistic high to soul-crushing low and back. Isaac comes as advertised in the title role, turning in an excellent performance and shining particularly in the moments the film slows down to showcase nothing but his performance singing and playing the guitar. As the Coens have previously stated, this had to be an extraordinarily difficult role to cast, but Isaac nails his character. Llewyn is beat down and pushed to the edge, but has such a passion for music that he simply cannot bear to walk away, and we see every nuance of that. As far as the supporting cast is concerned, Carey Mulligan stands out as Jean, Llewyn’s foul mouthed friend and occasional (though ever repenting of it) lover. She also benefits from considerably more screen time than Justin Timberlake, Ethan Phillips, Adam Driver, John Goodman, Garrett Hedlund, and others who nonetheless all turn in quality performances. Like Llewyn and Jean, they’re keenly drawn and full of personality. But like I said, this is a movie about one man, Llewyn Davis, and this is at once the film’s greatest strength and greatest weakness. It’s clear that there was a laser-focus going into this movie. The camera never leaves Llewyn; there’s not a scene, maybe not a shot, in the entire movie that doesn’t either A) feature Llewyn as the subject, or B) display exactly what Llewyn’s perceiving at that particular moment. It’s a beautiful approach, one many other films attempt often fail to commit to. Despite the decidedly interesting supporting characters, our attention is never diverted from Llewyn’s story. Inside Llewyn Davis is thematically highlighting the continuous nature of life. We may move forward, we may not, but we’re always moving, says the movie, while at the same time denying that life is by nature some grand, exciting, romantic adventure (the road trip Llewyn takes through most of the second act certainly speaks to this). Mostly, the story is about Llewyn learning to cope with the cyclical nature of his life while trying to make plans to movie forward. And that’s where my – problem is too harsh a word, so we’ll say disengagement – from the movie occurred. To its credit, the film does a great job of bringing home those thematic ideas without beating the audience over the head with them. But part of the way it does that is to have characters pop into and out of Llewyn’s life without notice. It feels authentic to reality, but it also makes the plot feel like a bit of a hodgepodge of random events rather than a purposeful narrative. This in turn contributes to the sensation that Llewyn’s character arc just isn’t very arc-y. 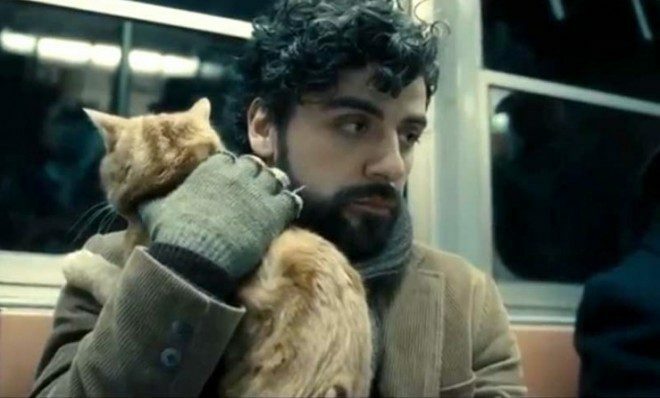 Yes, he’s in a slightly different place by the end of the film, but between the quazi-randomness of the plot and the lack of movement from its main character, Inside Llewyn Davis somewhat surprisingly becomes a film that’s difficult to connect to emotionally. I don’t mean to sound unfeeling. There are things which happen to Llewyn which are downright tragic, and it’s easy to empathize with the character. But this is a movie about touching the void inside each of us, and to do that, it perhaps necessarily feels just a touch vacuous upon reflection. It’s not anything that ruined my enjoyment of the movie, and really not anything you’re likely to notice while watching, but when the movie was over, I just about said to myself, “Well that was nice,” and then moved on with my day. Look, this is a very good movie, and a stellar piece of filmmaking and acting. It’s got a great soundtrack, I loved the wry humor in evidence throughout the film, and you’ll be hard pressed to find better written characters anywhere. Where the film fell a bit flat for me was in its overall sense of impact. This isn’t a movie that’s going to stay with me. That doesn’t mean it has nothing to say, nor that it says it poorly. It’s a spectacular character study and a love letter of sorts to the, shall we say, unsung artists of the ‘60s folk music scene. But when it’s all said and done, I’ll be very surprised if this is one of the Coen Brothers’ most celebrated works.